Hey Kids - Holiday Coloring Sheets are Here! We here at the USO wish you a happy holiday season from our family to yours, and this holiday season we have an extra special treat for the children. 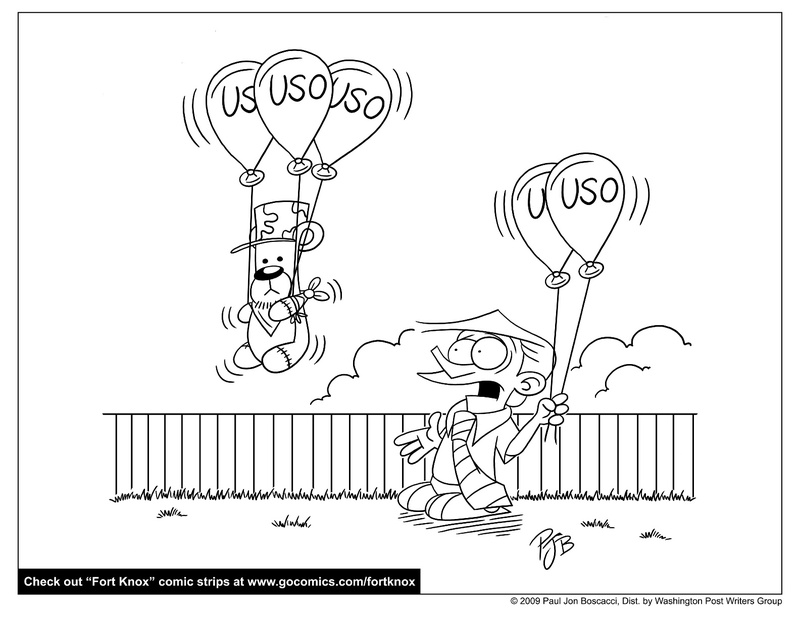 Click on any link underneath the pictures below to download a pdf coloring sheet…just for military kids! Cartoonist Paul Boscacci, the creater of the “Fort Knox” comic strip, has created exclusive pictures for “military brats” - like him! Print one out and color it for a loved one who’s in the military. Share them with friends and family. Send one to a service member overseas…or right next door. But most importantly, have fun! Coloring Contest! We almost forgot to mention: we want to see YOUR colorful creations. After you’ve finished one of these pictures, share it with us by having Mom or Dad help you scan it or take a picture. Then send an email with your picture to our blog team with the subject heading “Holiday Coloring Contest.” Our top entries will be featured on this blog all throughout the week of December 27th!